Angelcare Monitor and Sensorpad – When moving Ruby to her own room, the Angelcare monitor and Sensorpad gave us great peace of mind. We could not only see her on the webcam but we also use the sensorpad function which alarms if the baby stops moving for 10 seconds or more. The only time we have heard the alarm is when we have forgotten to turn it off and have taken her out her cot, so we know it works and is rather loud! Tommee Tippee Perfect Prep Machine – we purchased this the first night after doing bottles every few hours. This machine makes bottles the perfect temperature in two minutes which is great for those night feeds and you do not have to us Tommee Tippee bottles, our MAM ones fit just as well. MAM Anti-colic bottles – we like these bottles as they are self-sterilising so can be put in the microwave for 3 minutes and then ready to use. We also found that the flatter teat worked better with Ruby who struggled with the rounder teats of the Tommee Tippee bottles. Baby Sleep Plan by Alison Scott-Wright – I only heard about this book when Ruby was 6 weeks old. At the time she was struggling with an undiagnosed milk intolerance so was very unsettled. The book not only helps you implement a routine but it also talks through breastfeeding, bottle feeding, colic and reflux. As a first time Mum I found this book so helpful, more so than any midwife or health visitor and as a result of implementing the plan from around 7 weeks, we have a baby that went from waking every 3/4 hours to sleeping through the night from 7pm to 7am by 10 weeks. Joolz Earth Day pram – I have mentioned this on one of my other posts, this pram is awesome! It looks great and is so easy to use/fold down, best of all I have only ever seen one other person with one. It also comes with a great range of accessories for different weather and our car seat fits perfectly to the pram which is useful when dashing to the shops. Maxi Cozi Pebble with family ISOFIX base – Very safe and secure, fits well in all cars we have tried it in. I would say it is on the heavier side so now Ruby is getting that bit bigger I’m not sure how much longer I will be able to carry it to the car and back, might have to leave it in there! 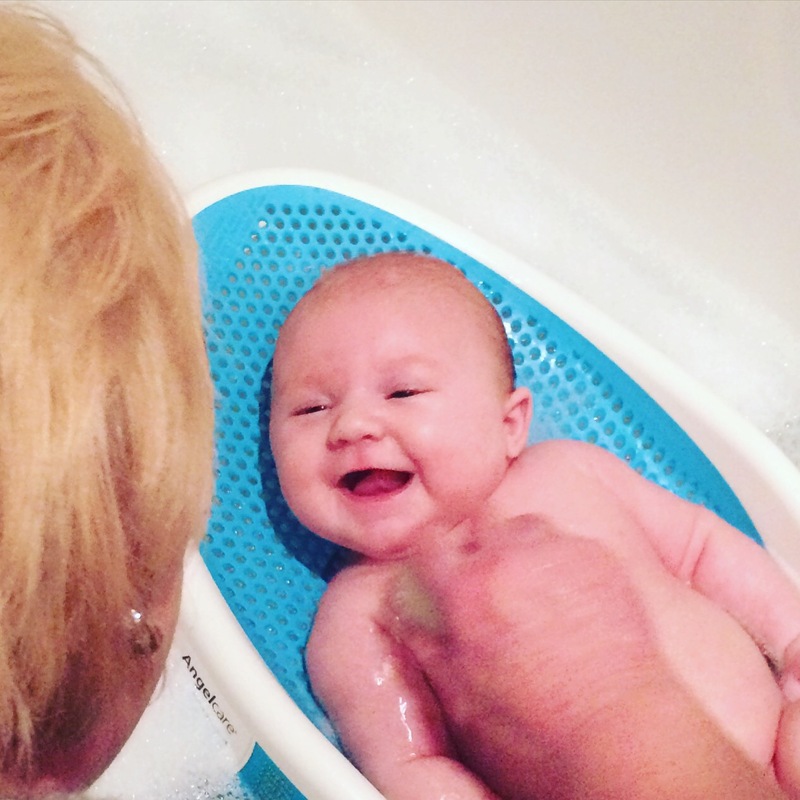 Angelcare bath seat – After spending a few weeks holding Ruby in her baby bath, we found this online and read so many good reviews we decided to try it. From day one she loved it, she was more comfortable on the seat and she now spends around 20 minutes each evening having her bath. Bumbo – we were given an older style Bumbo but I think principally it is the same as ones that are sold now. From 11 weeks, Ruby loved this chair and it provides great back support. Ewan the Dream Sheep – again this was something else we were given. I have read mixed reviews however we found Ewan to be pretty good. In the early days we would have the heartbeat setting on and it seemed to help settle her to sleep when in her moses. These days we just use it for a lullaby at night time. I think it is a little ont he expensive side, especially now you can get free apps for white noise. Boba baby Sling – one of my favourite Christmas presents. In the early weeks this sling was fantastic and one of the only ways Ruby would settle. It was so useful to have so I could get on with things in the day with both hands free! It can be used up to a few years old however Ruby now prefers the Baby Bjorn carrier as it is less restrictive.